Boston, MA — Massachusetts Governor Charlie Baker today signed H. 140 to protect LGBTQ youth from the dangerous practice of conversion therapy, which falsely claims to be able to change a person’s sexual orientation or gender identity. Massachusetts is the 16th state to legally prohibit licensed practitioners from using the discredited practice on minors. The Trevor Project, the world’s largest suicide prevention and crisis intervention organization for LGBTQ youth, is invested in ending conversion therapy in every state. A 2018 study found that the rate of attempted suicide by LGBTQ youth whose parents tried to change their sexual orientation was more than double the rate of LGBTQ youth who reported no such attempts. For LGBTQ young people who reported both home-based efforts to change their sexual orientation by parents and efforts by therapists or religious leaders, the rate was three times higher. “After many years of hard work and advocacy, I am so excited that today Massachusetts became the 16th state to finally ban conversion therapy for minors. I am grateful to Governor Charlie Baker for signing the bill, to House Speaker Robert A. DeLeo, Senate President Karen Spilka, my colleague in the Senate Julian Cyr, the majority of the Massachusetts Legislature and for a large coalition of advocates for getting this done. At last, LGBTQ youth in Massachusetts are now finally protected from harmful and abusive practices,” said State Representative Kay Khan. 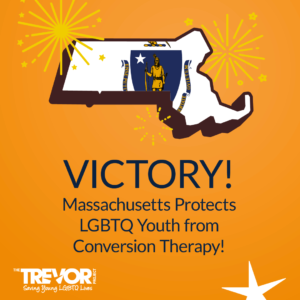 “We are grateful that MA will now protect young people from this fraudulent treatment which is both cruel and barbaric,” said Arline Isaacson, Co-Chair of The Massachusetts Coalition to Ban Conversion Therapy for Minors. The Trevor Project’s 50 Bills 50 States campaign has partnered with the Human Rights Campaign, National Center for Lesbian Rights, MassEquality and local advocates in support of these vital protections. People can sign up to join The Trevor Project’s effort to end conversion therapy by texting “TREVOR” to 40649. Learn more about reporting on conversion therapy.